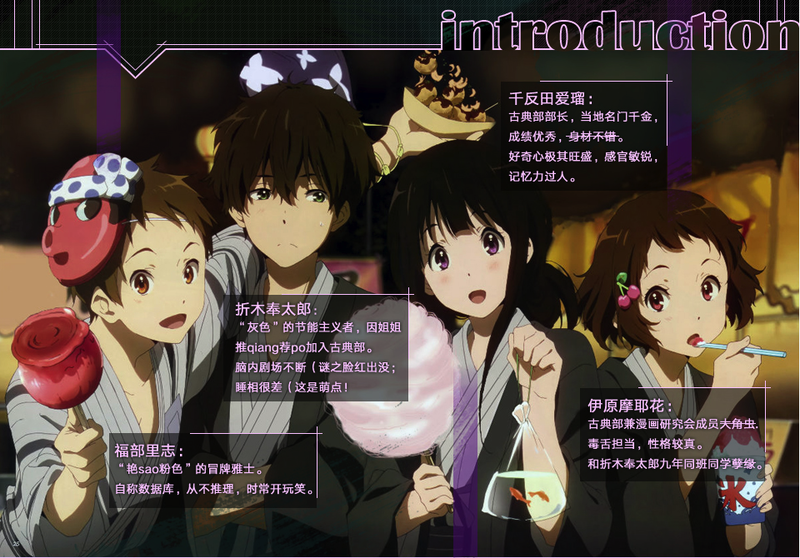 What does Hyouka mean to you? 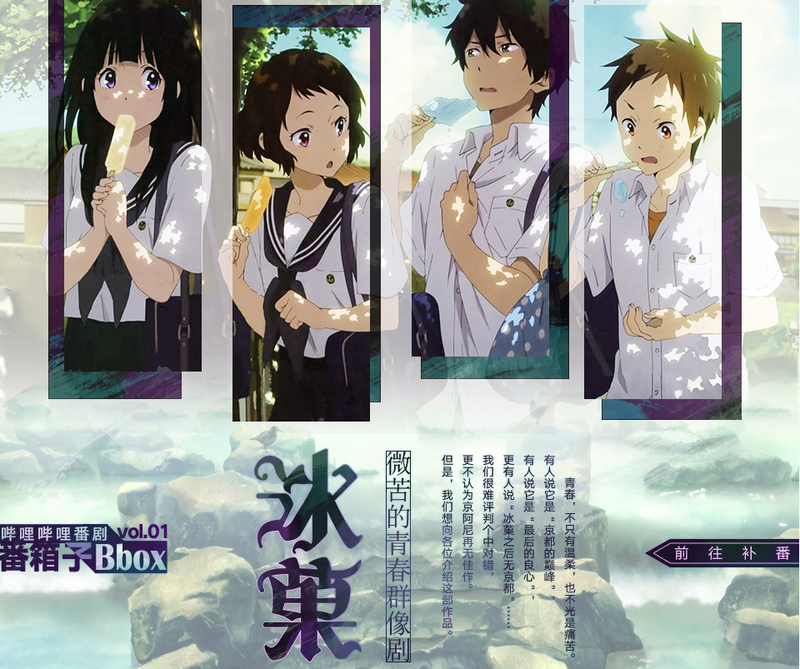 There are a ton of great essays on Hyouka, and a variety of interpretations. Is it a mystery? A slice-of-life? A romance? (Personally, I think it is a celebration of putting your heart into what you do, but that’s a post for another day). 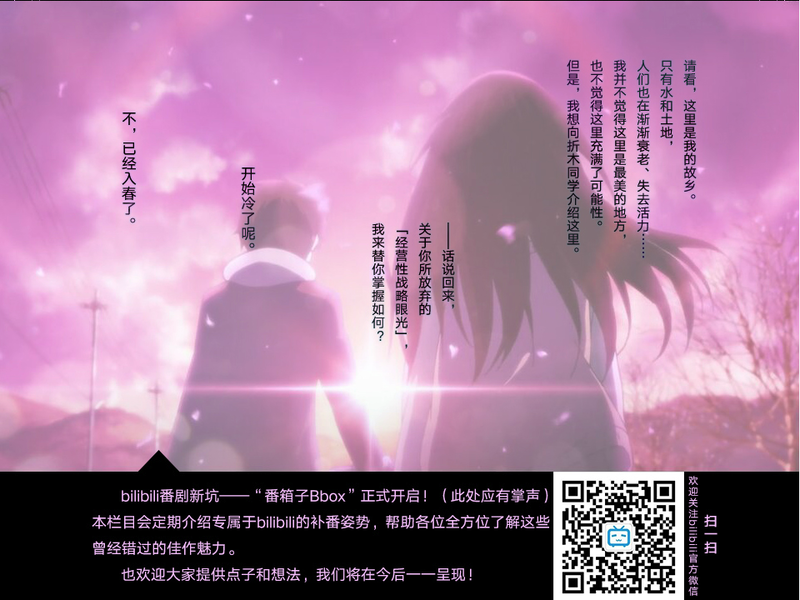 So when I saw that the Chinese anime streaming site bilibili.com had a column advertising Hyouka, I was interested to see what Hyouka meant to the Chinese-speaking internet (yes, I know this is a huge generalization). 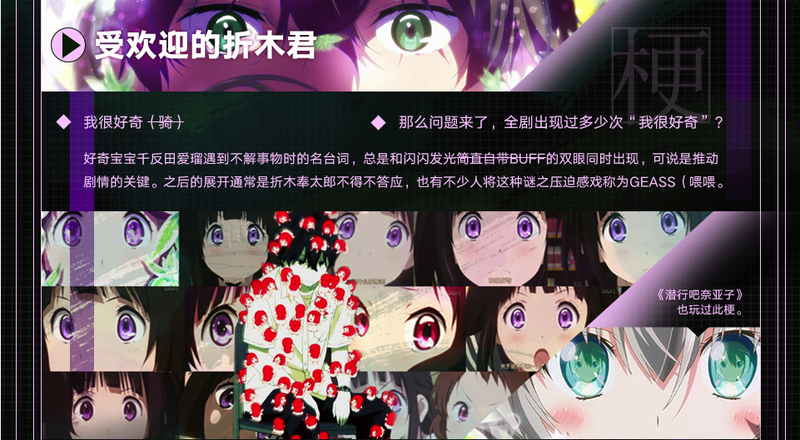 I wanted to see how Bilibili markets the show to its audience; it would be a cool peek into the mindset of Chinese anime fans. 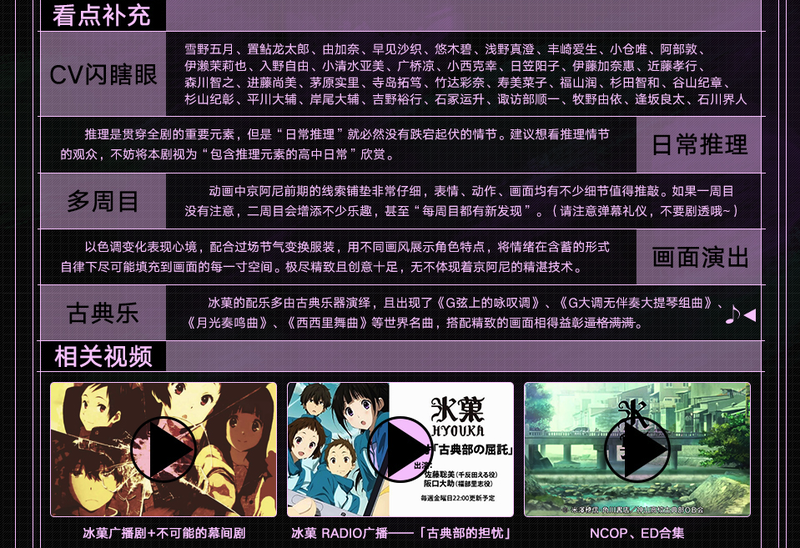 Below are screenshots of the quite-nice looking advertisement, with the link here, and my translation below. All copyrights belong to their respective owners. Adolescence: not all roses, but not just pain either. Some say, this is the peak of KyoAni. Some say, this is the end of their good conscience . But we for sure don’t think KyoAni hasn’t produced quality works after this. Most widely viewed among the old shows uploaded [to this site] in 2016. With this anime’s varied camera angles and numerous scenes, it becomes easy to clip and rearrange its segments, and therefore Hyouka is frequently made into AMVs . 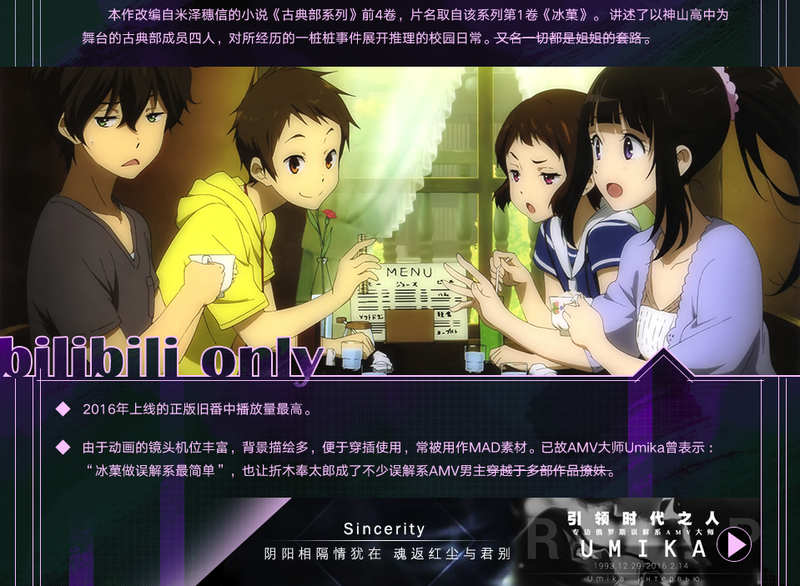 The late AMV specialist Umika once said “Hyouka is easiest to make into misleading AMVs ”. Oreki Houtarou has also become the protagonist of many “misleading AMVs” where he picks up girls across multiple anime series . A couplet that basically says even though we’re apart, our feelings toward each other remain. This raises a question: how many times does “I’m curious” appear in the show? Our Curious Darling Chitanda Eru’s famous line for when she encounters things she doesn’t understand. It’s always accompanied by sparkling eyes as if imbued with Power-Ups. This can be seen as the key to pushing the plot forward, and almost always results in Oreki dragged along despite himself. Many jokingly call this mysterious compulsive power the GEASS (hey, hey). Haiyore! Nyaruko-san has also pulled this trick. Chitanda Eru: president of the Classics Club, daughter of a local powerful family, with good grades, and her looks aren’t bad either. Extremely curious, with sharp senses and an excellent memory. Ibara Mayaka: member of both the Classics Club and the Manga Studies club and a whiz at drawing, with a sharp tongue and an earnest personality. Had the misfortune to be classmates for nine years with Oreki Houtarou. Fukube Satoshi: a fake refined gentleman of the “rose-coloured life”. Self-styled “the Database”, he never makes deductions. Often cracks jokes. 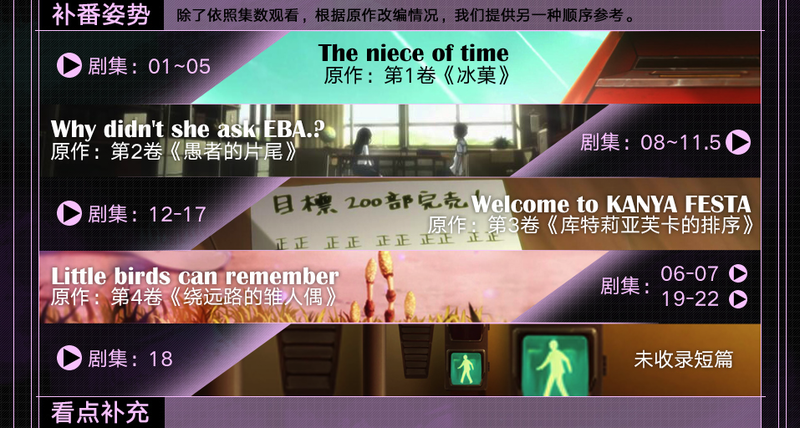 Recommended watch order: in addition to watching in the broadcast order, we also provide the option of watching in the order of the novels. The volumes are listed with the corresponding episodes. – Everyday Mysteries: the element of detective work runs through the entire series, but everyday mysteries necessarily preclude rising and falling plots. We suggest for those interested in detective fiction to appreciate this series as a high school slice-of-life with mystery elements. – Rewatchability: KyoAni was very meticulous in their construction of this work, with clues in character expressions, actions, and cinematography for viewers to analyze. If you didn’t notice all the details on the first watch, the second watch will be a lot of fun. You could even say there’s something new to notice on every rewatch. (Please be courteous and avoid spoilers in the onscreen comments ). – Cinematography: the show uses changes in colours to express mood, matches the clothing to the passage of seasons, varies the art style to highlight the different characters, and subtly depicts emotions with details in every corner of the frame. Ornate and creative, it fully showcases KyoAni’s mastery of craft. – Classical Music: most of Hyouka’s soundtrack is played with orchestral instruments, featuring renowned pieces such as “Air on a G-String”, “Cello Suite in G”, “Moonlight Sonata”, “The Siciliana”, it combines brilliantly with the beautiful visuals and is completely badass. I don’t think this is the most beautiful place, nor is it full of potential. Yet, I wanted to show you this place, Oreki-san. —Say, about the “business side of things” that you gave up on, how about I take care of that for you? This column will regulary update to introduce Bilibili-exclusive series, to help everyone fully appreciate the allure of these lesser-known masterpieces. Whew! Translating is a lot of work, and I certainly have a lot to learn! I speak Mandarin natively, but being out of touch with the Chinese Internet, I had to look up countless words to get their contemporary meanings. If I misinterpreted anything, or if anything can be translated better, please let me know! EDIT: Good conscience: anime fan slang for when a studio’s talents come together to create a beautiful production. As if they’ve “found their conscience” and made a good anime. Notice the informal tone of the advertisement, with the strikethroughs, the parentheses, and also notice the subtle targeting of otaku with the mention of moe qualities and the references to other anime. The original term MAD appears to cover both abridged series and AMVs. Apparently AMVs that mislead viewers about the plot is a genre by itself?! For some reason people in East Asia have the option of watching comments roll across the screen as others react to specific scenes (remember the Jiggly Heaven sequence of Shirobako? ).